Prices are rising, as they inevitably must with an expansionary policy, and who is getting the blame? Not the Fed. Commentators claim it's the weather or foreigners with greedy appetites for goods. It has always been so: when the inflation arrives, the relationship between cause and effect is lost. This precisely why Hazlitt wrote this fantastic book. He drives home the point that the issue is not weather, not greed, not gouging, but monetary policy of the central bank. It's never been more important than now that Hazlitt's message be heard. Henry Hazlitt knew the works of Mises as well as anyone but he was not mainly a theoretician. He was a financial journalist, commentator, and interpreter of current events. In this sense, he was one of a kind: a learned economist with both feet in the real world of politics, financial markets, and the economics of everyday life. By inflation, he didn't mean rising prices. He meant the tendency of government and the central bank to print money in pursuit of prosperity. In this sense, no book could be more directly related to our own times, as Bernanke and Company use and abuse the power of the Fed as never before. He begins with an overview of what inflation is and covers the abysmal record of government money management. He clearly explains the cause and effect: first comes the printing and then come the business cycles and price increases. He explains that the only real cure for all of the effects is to treat the cause: end the government's power to print. For this reason, Hazlitt favors a gold standard. The first section is perfect as an introduction to the topic but the second section is enormously valuable for anyone who wants more depth on the topic. He explains what is wrong with monetarism, what is wrong with demand-side management, what is wrong with the Phillips Curve, what is wrong with theories about "unused capacity," what is wrong with government stimulus packages, what is wrong with inflation indexing, why inflation tends to be global now, and he even adds a very thoughtful critique of Hayek's proposal for free choice among currencies: it does go nearly far enough to reform money. From a reader's point of view, Hazlitt's book is pure pleasure. As Mencken said of him, he was the only economist of his generation who could really write. He is clear as a bell, and why? Because he had a passion for explaining economics to every living person. He did not think that economics should be left to the academy or to investment firms. Like Mises, he believed it was the business of everyone. This book came out in 1978 and it's been many decades out of print. 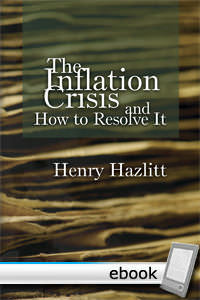 It was supposed to be a redo of What You Should Know About Inflation, but as Hazlitt said, it turned into a completely new book. This is one that the Mises Institute wanted to have in print for many years, and it is an event to celebrate that it is finally here, in a beautiful edition at a rock-bottom price. Toward the complete decontrol of money.